This is the very best Hyaluronic Acid by Pure Encapsulations I have bought, a little pricey but you get what you pay for. The tissues of your body have an amazing ability to renew‚ restore‚ and heal themselves. Hyaluronic acid (HA) is a natural polymer comprised of alternating units of N-acetyl-d-glucosamine and D-glucuronate that aid in this process. Almost 50 percent of all hyaluronic acid in the body is concentrated in the skin‚ with most of the rest contained in the synovial fluid that surrounds the joints. 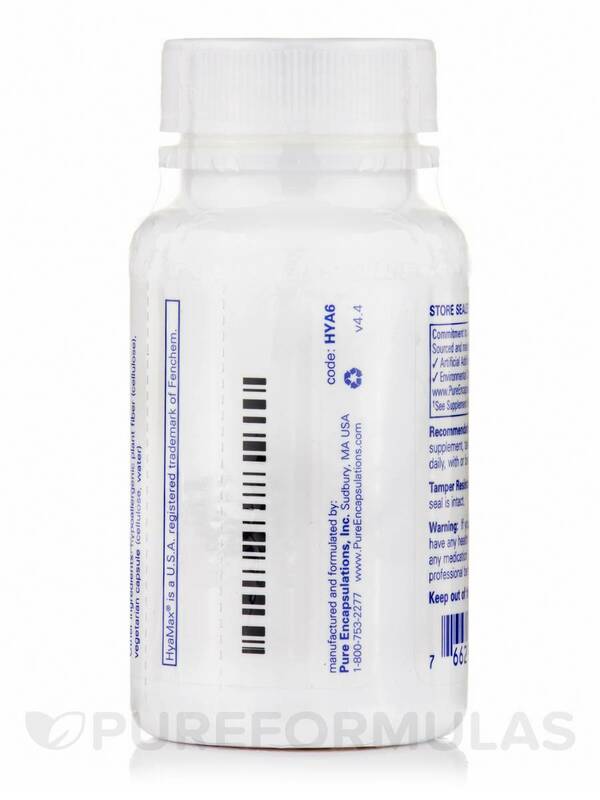 This acid has the ability to attract and retain water in the outside cellular wall of tissues and skin layers‚ aiding in hydration‚ nutrient delivery‚ and waste removal. Hyaluronic acid also promotes the renewal of skin cells called keratinocytes‚ which moderate the appearance of lines and age spots. HA also helps lubricate joints and preserve cartilage‚ supporting joint function by acting as a shock absorber. As you age‚ however‚ natural concentrations of hyaluronic acid decline; skin tone and elasticity is reduced‚ wrinkles and lines develop‚ and joints become more susceptible to wear and tear. 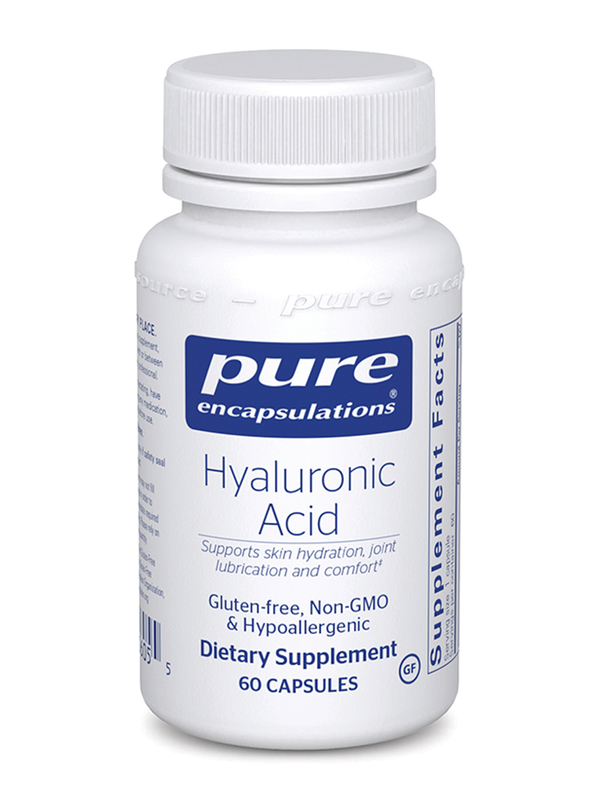 Hyaluronic Acid by Pure Encapsulations is a supplement that contains hyaluronic acid to help maintain skin health and support joint function. In combination with a healthy diet and lifestyle‚ these vegetable capsules can help hydrate your skin‚ making it smoother and restoring a healthy‚ youthful appearance while reducing the development of lines and age spots. HA may potentially reduce the visible signs of acne scars and sun damage. It may also play a role in lubricating joints‚ promoting the development of healthy synovial fluid‚ and reducing joint pain or stiffness. Each capsule provides 70 mg of hyaluronic acid powder derived from rooster comb‚ which contains at least nine percent hyaluronic acid. This is in addition to maltodextrin‚ a complex carbohydrate stabilizer that improves absorption and reduces gastrointestinal distress. 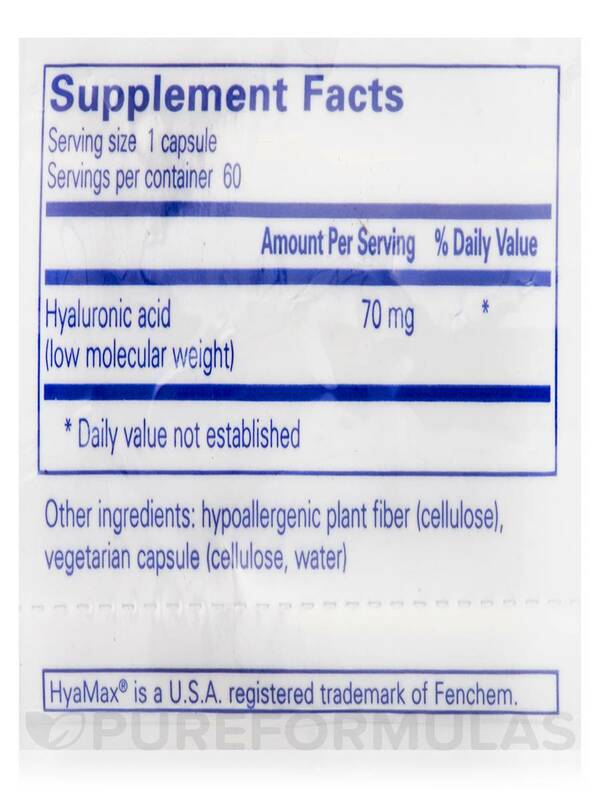 Finally‚ this supplement contains hypoallergenic plant fiber from pine cellulose for volume. 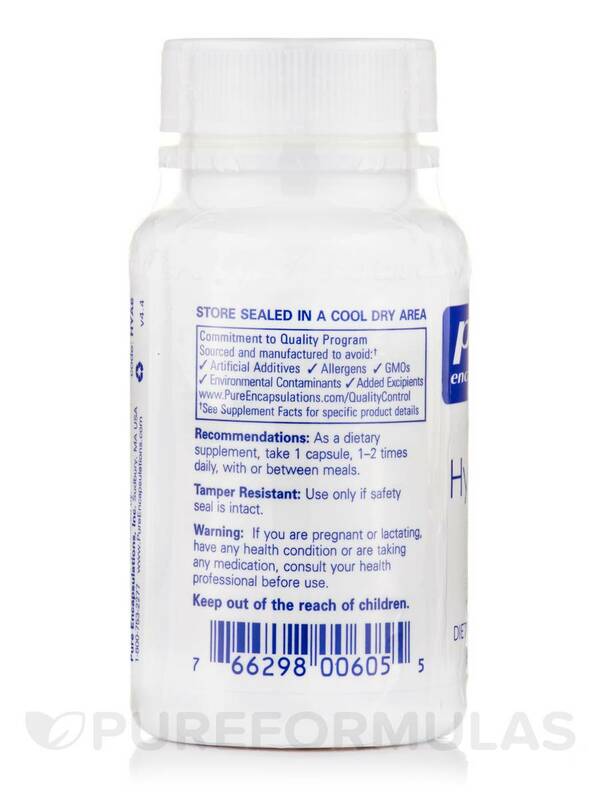 Take the recommended dose of one or two capsules daily‚ and this bottle will last for almost two months. As a dietary supplement‚ take 1 capsule‚ 1-2 times daily‚ with or between meals. I was waiting to get approved for hyaluronic injection in my knee so I tried this Hyaluronic Acid by Pure Encapsulations and this helped to lessen the pain in the joint. 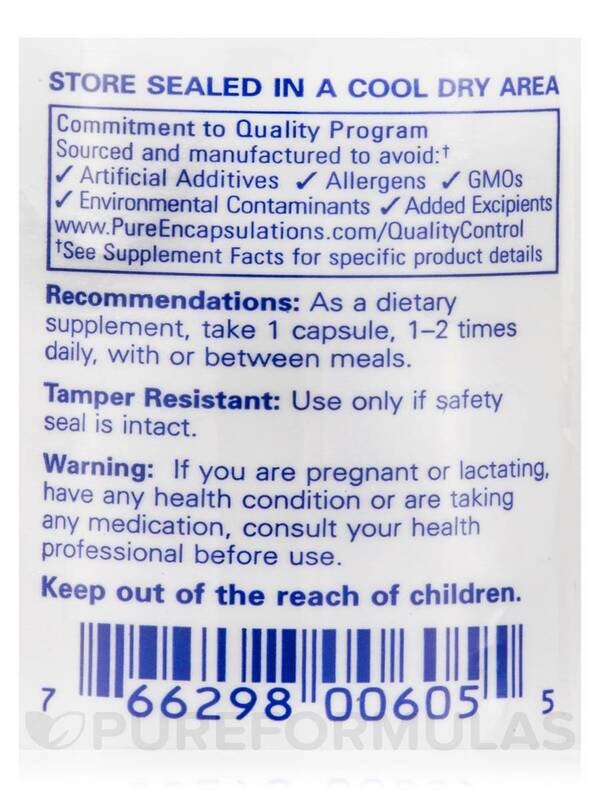 It has very tiny pills that are easy to swallow and quality ingredients. I don't understand the rave reviews about Hyaluronic Acid by Pure Encapsulations. Simply it doesn't work for me. But I have been taking it now for couple of months and honestly no results in my skin or joints. I have noticed the difference in my skin since I have been using this Hyaluronic Acid by Pure Encapsulations. It is more hydrating and has an uplifted appearance that leaves me more youthful looking. I got this Hyaluronic Acid by Pure Encapsulations for my bones and joints and I have no way to determine how it helped. But my skin looks younger. And this kind has the molecular weight HA that was recommended by my naturopath. This is the best price I've seen for the special "good" kind. Sold. I would get these horrible cracks in my fingers around my fingertips every winter. It was painful and never ending... well, at least through the winter. Buttoning clothes was a chore. I found out about hyaluronic acid, THEN I found that the 'low molecular weight' HA (rooster comb) such as Hyaluronic Acid by Pure Encapsulations was far superior. (some of the cheaper, higher molecular weight are not as absorbable) After about a months use there was a dramatic difference in my hands! I used to take it in winter but I take year round now because it has so many other health benefits. A staple in my world. Pure Encapsulations is my top choice, too. Best supplement for dry winter skin! I have restarted taking this supplement in order to help my bones.